French "impressionism� has left us with a rather limited vision of the harp, as if its most obvious characteristic were that of lending itself to the attentions of loosely-robed girls with long blonde tresses, capable of drawing from it nothing more than seductive glissandi. But the harp also had another harder, stronger, more aggressive face� [but] sometimes it must sound like a forest with the wind blowing through it. Luciano Berio�s assessment of harp music may seem a little severe, but he had a point. The instrument�s reputation seems too often to be based upon music that is picturesque and charming, or upon its ability to add colour to orchestral scores. This is not only via the French impressionism to which Berio alluded, but through more recent works which emphasise a rather easy-listening aesthetic. However, the harp deserves attention as a solo instrument capable of real depth, and the selection of works on this disc, all of them written in the 20th or 21st centuries by British composers, offers the listener a refreshing perspective from which to hear the instrument�s capabilities. Malcom Arnold�s Fantasy for Harp, Op.117, was commissioned by Welsh harpist Osian Ellis, a celebrated performer who also inspired Britten�s Suite for Harp. Arnold had recently moved from Cornwall to Ireland, a location steeped in Gaelic and Celtic �bardic� harp music, styles which influenced the composition of this work. The Fantasy is a continuous piece divided into five episodes. The first section, a Lament, is the only part which makes use of the more conventional sweeping gestures associated with much harp music, though these are delivered with a certain degree of force, creating an unsettled atmosphere. The sprightly March exploits the instrument�s muscular tone with firmly-plucked, folk-like material. The central Nocturne is a haunting, atmospheric episode, followed by an agitated Scherzo which alludes to the opening Lament; and the Lament theme returns again in the Finale. Osian Ellis gave the work�s premiere in January 1976, at the Law Society Hall in London. Awuya begins with African drumming rhythms using the body of the harp, leading into shifts in musical colour intended to suggest the mutating trypanosomes. There follows the first articulation of the lullaby; and each time the Lullaby appears, it has a more hopeful quality, ending the work in a mood of optimism, reflecting the hope that scientific endeavour can help humanity overcome tragic threats. The work was premiered at Glasgow University on 1 January, 1998 by Professor Vickerman�s daughter, harpist Louise Vickerman. Andy Scott (b.1966) composed Crossing Waves in 2010, commissioned by Keziah Thomas, and inspired by the epic journey of Roz Savage, who rowed solo across the Atlantic Ocean in 2005. Scott perceived parallels between Savage�s spirit and that of many musicians, with shared qualities of creativity, resourcefulness, single-mindedness and determination. The work unfolds in three sections, each reflecting aspects of a journey. The first is characterised by the sense of anticipation and nervous expectation felt before embarking upon a potentially treacherous voyage. There are moments which conjure up sudden changes in weather, but others during which a regular pulse is established, suggestive of steadier conditions. The central section evokes tranquil isolation in the middle of the ocean, and the final episode represents a burst of energy and hope, anticipating the journey�s end. 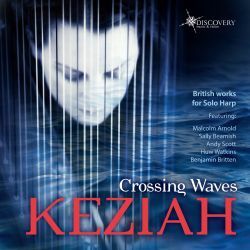 Keziah Thomas gave the world premiere of Crossing Waves on 26 September, 2010, at The Forge in London, and went on to give the U.S. premiere at the Weill Recital Hall, at New York�s Carnegie Hall, on 16 October of the same year. Huw Watkins was born in 1976, the year in which Benjamin Britten died (and the year in which Arnold�s Fantasy for Harp was premiered). There are parallels to be drawn between the Suites by Britten and Watkins; in addition to the same title, both have connections with the musical life of Wales. Britten�s Suite (like Arnold�s Fantasy) was written for the Welsh harpist Osian Ellis, and the last movement is a set of variations on the Welsh hymn-tune �St Denio�. Huw Watkins was born in South Wales, and his Suite for Harp was commissioned by the Presteigne Festival of Music. It was premiered in Presteigne in Wales on 28 August 2006. Furthermore, both Suites draw upon forms which have associations with earlier suite movements, particularly those of the Baroque; and both have a Toccata. The Suite for Harp by Huw Watkins begins with an ominous March which exploits the instrument�s lower register, ending quietly with an ascending glissando. The mercurial Toccata unfolds in continuous semiquavers, culminating in a passage in the instrument�s upper register. The serenity of the Lullaby is followed by a vibrant Gigue which, like every movement in this Suite, ends very quietly. Britten completed his Suite for Harp, Op.83, on 18 March 1969. The work was written for Osian Ellis, who premiered it on 24 June 1969 in the Jubilee Hall, Aldeburgh; the London premiere followed on 28 September. The Suite was part of a programme which fuelled criticism of Britten that he had retreated into an intimate, nostalgic world too far removed from reality. Yet the writing for the harp in this Suite is highly idiomatic; Britten well understood how to work with, rather than against, an instrument�s nature � a fact which is the more significant in an era of experimentation with instrumental capacities (Berio had sought to challenge conventional approaches to the instrument in his Sequenza II for Harp of 1963.) In this context, Britten�s writing seems particularly tasteful and respectful, at the same time as avoiding the clichés of the harp repertoire. Britten wrote in 1969 that �This short Suite was written in February and March this year especially for our Chosen Artist� � referring to Ellis who, in addition to his illustrious reputation, was of great assistance to Britten, accompanying his partner Peter Pears after the composer�s heart operation of 1973 necessitated an end to his performing career.